Pilgrim Church was founded in 1859. Of the 34 charter members, 5 were Wesley Methodist, 10 Methodist Episcopal, 4 Presbyterian, and 11 Congregational. Many doubted that a church with such diversified ideas on religion would hold together, but it did . . . and flourished, eventually becoming part of the United Church of Christ. In 1865, two lots at the corner of Howard and Jennings (now W. 14th) were donated to build a church. The basement was finished in 1866, the upper auditorium in 1869, at a cost of $16,000. Offer classes in music, languages, photography, sewing, stenography, bookkeeping, penmanship, mechanical drawing, gardening, and Bible study. The cornerstone was laid on July 6th, 1893, on donated land and the church was completed for a total cost of $135,000. The buildings exterior is a brownish red sandstone from Jacobville, Michigan. The original color is still visible on the front portico. The bell towers have round-headed lancet windows, rose windows, corner turrets, and pyramidal roofs. The northeast tower stands at 150 feet and houses one brass bell, cast by McShane Bell Foundry in Baltimore, and repaired in 1998. The central east tower is enclosed without a bell. Large stained glass windows fill the north and east gables. In 1894, the building was dedicated, the first building west of the Cuyahoga River to use electricity (we had our own power plant). True to Victorian fashion, gas piping and gas lights were also installed as backup. You can see examples of this feature in the front entrance chandelier, the balcony stair newel light, the wall sconces, and the Little Theater chandelier. As if to celebrate the exiting arrival of electricity, bare light bulbs once lined each arch and f illed the golden rosettes where the arches meet. The stained glass dome, designed by Elizabeth Parsons, was originally sunlit, but later was converted to artificial lighting. Four semi-circular arches support the 24′ diameter dome. Flanking the organ are two stained glass windows (likely made by Tiffany Studios), both featuring images of St. Cecelia. In the recent renovation of this beautiful sanctuary, the dome was repaired, relit, and the wood trim regilded. The wall sconces were reproduced and replaced, and three more were added to the balcony area. In addition, all general and accent lighting was rewired and improved. The west wall of the sanctuary exhibits a Farrand-Votey pipe organ. It is one pipe organ configuration that is still playing in the United States. The instrument is an impressive 40 rank organ with 61 stops and 2,262 pipes in a carved wood case. In 1992, the pipe organ was restored to capture the original tone, voice and balance. The façade of the pipes was restored by 60 volunteers who hand stenciled the final design. At the top of the organ sits Angel Gabriel now refurbished, regilded and reinstalled. Pilgrim also hosts the largest example of the “Akron Plan.” Movable walls and windows allow for flexible use and the expansion of space. The south sanctuary wall is actually a large operable panel on a pulley system and originally could be raised allowing for additional seating. With all the walls raised and windows open, the church could seat 1,250. To accommodate such a large crowd, the seating is curved on a ramped floor over two levels enhancing sight lines and acoustics. furniture. Observe the architectural echoes in pulpit and communion table design, as well as an emphasis on natural elements and forms that continue throughout the interior design. In 1995, the chancel was restored with hand-painted paper in its dome, new lower wall coverings, and the original furnishings were reinstalled. balcony pew cushions are original and are made of mohair stuffed with kapok. The arrangement of the pews has changed several times over the years, and during the past renovation with the installation of new carpeting they were repaired, reassembled and placed more accurately. All interior surfaces are painted plaster, and were originally decorated with hand-stenciled patterns. (Note example behind glass in window cove at rear.) Throughout 2000 and 2001, the walls were repaired and painted with historically compatible color schemes, stenciling and materials. Volunteers gathered to hand paint and stencil 478 feet of paper that now covers the main arches. (See Restoration and Renovation for details.) The bosses were regilded and a new floor was installed in the choir loft. Main Theatre – Coffered with oak beams and glass ceiling panels for natural light, the theatre is ringed by 12 small gallery rooms with risers for seating and operable doors opening onto the theatre and sanctuary. Little Theatre – The upper theatre connects to the sanctuary with interior pocket windows and displays a large rose window. 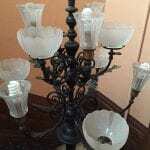 It still hosts an original electric/gas light fixture. Lower Hall – In 1994, Pilgrim began the renovation of the lower hall where you will find classrooms, meeting rooms, offices, the dining hall and kitchen, a parlor, restrooms, and a boiler room. In each outer room, tall exterior windows bring natural light. Interior transom windows continue to spread natural light to the interior halls. Pilgrim’s boiler room contained a steam engine to power a generator for electricity, a moving wall system, and ventilating fans. A hand-fired coal boiler was replaced with natural gas in the 1950s. Attic – Climb the stairs to the attic to find a complex system of original knob and tube wiring. The huge wooden beams and roof trusses were actually assembled on site. The original cable and counterweight systems used to control movable walls are still present and dramatic catwalks encircle the dome from above. Community Building – In 1919, a community building was added for more recreation space. Originally, the loft contained a boxing ring. The ground floor contained a 4-lane bowling alley, which now houses a day center for homeless families. The first floor has a gym (which continues to be in use), showers and toilets. From 1999 to 2001, repairs to the roof, gutters, and downspouts were made, as well as the installation of a building wide fire alarm system. The growing congregation has vigorously and generously supported major restoration and renovation throughout the years. The most recent renovation work to the sanctuary is estimated at $300,000. Our worship space is similar now to its original design, and full of power to inspire, welcome, comfort, delight, and glorify God. We treasure our building as a legacy and trust, a place of witness and service that has housed, enlivened, and enabled vital ministries for over 100 years. And although a church is always more than a building, much of our ministry is made possible because our wise forbearers built a church home where faith could be put into action. We have much more work to do to improve our venerable building so Pilgrim can continue its tradition as the Church of the Open Door, the Open Heart, and the Open Mind. Volunteers met 45 times over 13 months for at least 1,955 hours to roll on background color, draw and cut stencils, stencil, paint, highlight and trim the 478 feet of paper that now covers the main arches in our sanctuary. Eight volunteers spent 72 hours trimming 2,538 feet of border paper in 4 days. The design of the décor has been guided by Victorian restoration specialist Dale Smith of Schweinfurth House. An elevator, intended to provide a higher level of accessibility for members, was dedicated on June 1st, 2008. Funds for the addition to the church were raised through the generosity of Pilgrim people and through the Pilgrim Rising Campaign. In 2009, Pilgrim modified its second floor chapel to a day space for the Family Promise of Greater Cleveland.